Beginning Thursday, Dec. 12, Desert View Hospital will be able to provide magnetic resonance imaging services five days a week with the installation of a permanent MRI machine on the medical campus. 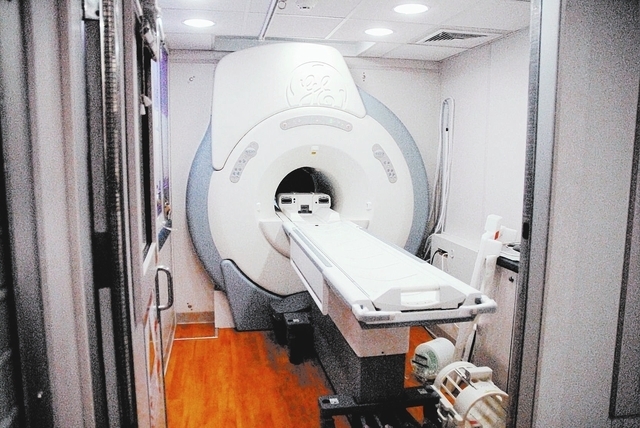 The new Signa HDxt 1.5T 16 channel magnet, which was recently purchased by the hospital, is supposed to provide clear, high-definition MRI images by combining advanced applications and work flow improvements on a high definition platform, according to its manufacturers at GE HealthCare. Up until now, the hospital relied on a mobile MRI machine provided by Perspectives Imaging that was only available to hospital staff three days a week, Monday through Wednesday, for appointments. The new permanent device will now be available for imaging services Monday through Friday on the hospital campus. Angela Losonsky, Diagnostic Imaging Manager at Desert View Hospital, explained MRI is often times used to take images of the brain, spine, knees, shoulders and back to give medical personnel a better look at the soft tissues in those areas. She added that the MRI differs from a regular x-ray or CT scan in the fact that it shows more soft tissues, like ligaments, than the other two imagining techniques. Losonsky said the purchase of the permanent MRI magnet is a valuable addition to the imaging services Desert View Hospital has to offer. Having an MRI machine available for use five days a week, instead of just three days a week, gives patients a greater number of options locally when it comes to testing, instead of having to drive into Las Vegas for all of their care, she said. As of Wednesday the hospital already had multiple appointments set to do MRI imaging for patients with the new equipment the first day it was available for use. While the hospital is currently accepting appointments Monday through Friday for MRI imaging, Losonsky added if the demand for the service continues to grow the hospital will look at possibly adding additional appointment days on the weekends if deemed necessary in the future. For more information about the new MRI machine at Desert View Hospital or to find out how to schedule an appointment, call 775-751-7554.